Turkey has been a staple at Thanksgiving dinner tables for generations, and many times, you'll find it accompanied by stuffing. The traditional way to prepare stuffing is inside the turkey, but in the past few decades, chefs and professionals have become wary of it due to health concerns. So, before you start preparing for the Thanksgiving feast at your restaurant, soup kitchen, or banquet hall, you should understand why stuffing a turkey is unsafe, alternative ways to prepare stuffing, and the proper way to stuff a turkey. Stuffing is a mixture that usually consists of dried bread, such as cornbread, croutons, or breadcrumbs, which is then mixed with meat, onion, celery, and sage. The mixture is then inserted into meat or vegetables and roasted. There are many different varieties, and one of the benefits of stuffing is that it's extremely versatile and works well with various flavors. Plus, while turkey is most commonly associated with stuffing, you can stuff many foods, like chicken, pork, mushrooms, and bell peppers, just to name a few. When looking up stuffing recipes, you may see it being referred to as "dressing" instead of "stuffing." So what is the difference between stuffing and dressing? Dressing is a name for stuffing that is cooked separately from poultry, meat, or vegetables and then served alongside it rather than inside it. Additionally, in the American South, many people use the term "dressing" to refer to both stuffing and dressing, but everywhere else, most people refer to both as stuffing. Is It Safe to Cook Stuffing Inside of a Turkey? While many residential cooks and Thanksgiving lovers debate over whether or not stuffing a turkey is safe, most chefs and food professionals agree that stuffing a turkey is not safe. At least, not the way that your parents and grandparents used to make it. So, why is stuffing a turkey considered unsafe? Stuffing is very porous, and during the cooking process juices from the turkey that contain bacteria drip down and are absorbed by the stuffing. Plus, when checking the temperature, many chefs neglect to check the temperature of the stuffing, which also needs to be cooked to 165 degrees Fahrenheit. 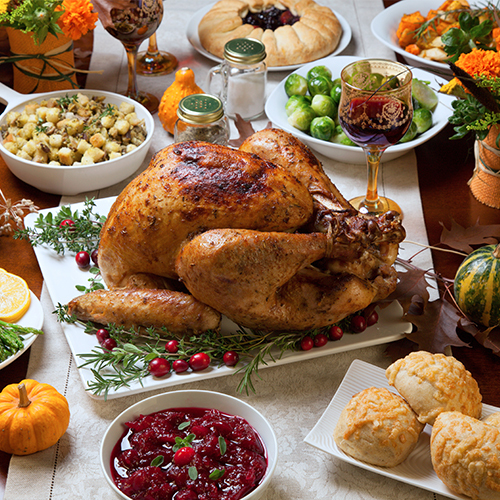 As a result, there is still bacteria in the stuffing that can cause guests to get sick. If cooking stuffing inside a turkey is unsafe, then why do people still insist on doing it? One of the main arguments for stuffing a turkey is the taste. Some chefs claim that stuffing cooked inside the turkey has a more savory and delicious flavor because it absorbs the juices from the turkey. Regardless of the truth behind this, there are several ways that you can enhance the flavor of your turkey without putting your guests at risk of getting sick. 1. Pack the stuffing inside the turkey. 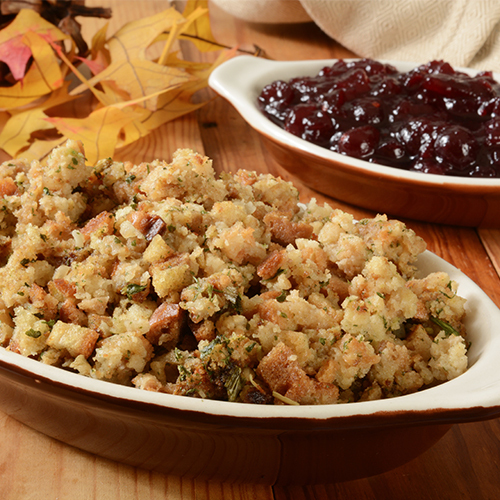 Additionally, don't pack the stuffing too tightly; you should use 3/4 cup of stuffing for every pound of turkey. 2. The stuffing should be moist and warm before you put it in the turkey. 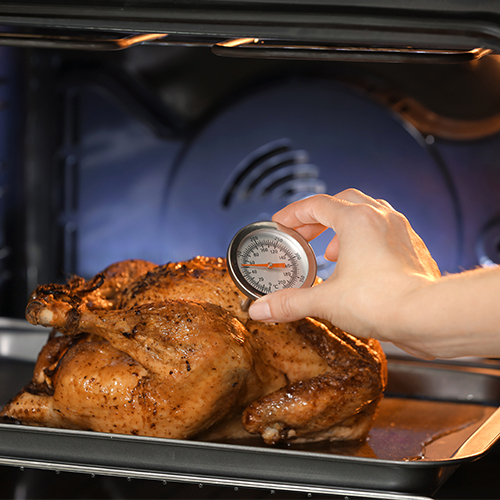 Bacteria is destroyed faster if it's in a moist environment, and if the stuffing is warm when it goes in, it will heat up to a safe temperature faster. 3. When checking the temperature of your turkey, also insert your thermometer into the center of the stuffing. Both the turkey and the stuffing must reach a temperature of 165 degrees Fahrenheit to be safe to eat. 4. After the turkey and stuffing have reached a food safe temperature, take the turkey out of the oven and let it rest under foil for at least 20 minutes. 5. If you have leftovers, they must be refrigerated no more than 2 hours after you take the turkey out of the oven. The stuffing will be safe to eat for 3 or 4 days, but make sure to heat it up to 165 degrees when reheating your leftovers. Once the turkey has reached 165 degrees, carve off the white meat and let it rest. Then, put the turkey and stuffing back in the oven until the stuffing reaches 165 degrees. White meat dries out faster than dark meat, so taking it off ensures that you can cook your stuffing safely without drying out the meat. When your turkey is 2/3 of the way done cooking, create an aluminum foil tent over it. The aluminum foil will help keep the heat in and bring your stuffing up to safe temperature faster. Stuff your turkey right before it goes into the oven. Many home chefs will stuff their turkey the night before in an attempt to save time on Thanksgiving, but this is only creating more time for bacteria to soak into your stuffing. A benefit of cooking the stuffing separately is that you can make larger quantities of it for your customers. Plus, if you make it separately, you can give your stuffing a crispy texture that is an excellent complement to the savory and juicy turkey and creamy mashed potatoes. If you cook your stuffing and turkey separately, you can still present your customers with a beautiful display of a perfectly cooked turkey that is overflowing with stuffing. Simply stuff your turkey with cooked stuffing once it has finished cooking and is resting. Stuffing a turkey can be dangerous and unsanitary because bacteria can infect the stuffing, and many chefs do not bring the stuffing up to a safe temperature before serving it. But there are steps you can take to prepare stuffing inside a turkey safely, and if you’d rather avoid the hassle, there are several alternative ways you can prepare your favorite side dish. So, when Thanksgiving rolls around this year, make sure that you’re serving your guests safe stuffing.